Original Stix, a Detroit-based startup that manufactures phone cases using recycled broken hockey sticks, has entered into an agreement to manufacture National Hockey League team phone cases. “We’re looking forward to expanding our product offering for NHL fans, so they can support their favorite NHL team,” says Terry Johnson, co-founder of Original Stix. Founded in the summer of 2014, Original Stix works with local manufacturers to recycle broken hockey sticks from college, minor league, and NHL teams across the country. Finished cases feature two interchangeable, rectangular recycled hockey stick panels and an exterior plastic frame. The NHL phone cases, which will feature the Original Stix case design with logos from NHL teams, will launch in time for the holiday season. As part of the partnership, Original Stix will also be working with Hoot, a Newark-based mobile accessory company that has an NHL license, to create the cases. 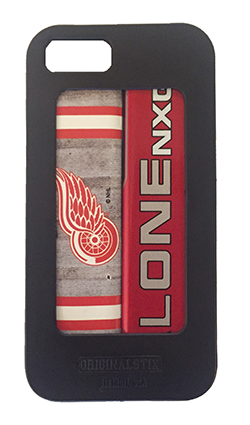 The NHL partnership cases will retail for about $45, and be available for purchase on the Original Stix and Hoot websites; retailers throughout North America and Europe, such as Mitten Sports in Farmington Hills; and NHL arenas. “(The partnership) will allow us to grow our business and get into new areas that we have not yet tapped into, including retailers, stadiums, and through our digital presence,” Johnson says. In June, Original Stix participated in the Pitch to Rich Detroit competition hosted by Virgin Group’s Richard Branson. Since then, Branson invited the company’s founders to participate in the Chicago Startup Summit in August, and is providing ongoing mentorship and business opportunities. Original Stix has shipped more than 6,000 cell phone cases worldwide. Moving forward, the company has plans to add more devices and products, and possibly expand into different sports, Johnson says.